MarketsWorld, a regulated and trusted binary options online trading platform. In most areas MarketsWorld scored very highly. Bonuses scored a high rating of 90 out of 100 due to the wide range of generous bonuses that are on offer by MarketsWorld. Customer support also scored high as the support team was responsive and helpful. The trading platform scored reasonably well due to its user-friendly interface and performance. Unfortunately due to the fact that there are only a limited number of underlying assets and one type of option choice, we gave that category a low score of just 50 out of 100. In the relatively new and exciting world of binary options online trading, it is important that you select the right broker to work with. This is because the broker will play an integral role in determining your profitability as a binary options online trader. That’s why it is important that you understand how the broker works, and what they have to offer. To save you the legwork we have conducted due diligence in this in-depth review of MarketsWorld. With all the information that you have gathered from our review of MarketsWorld, you will be able to make a more informed decision as to whether this is the best broker for you to work with. MarketsWorld is a binary options online trading platform that was established in 2011. It is based on the Isle of Man, a self governing territory which lies between Ireland and Great Britain. The MarketsWorld brand is owned and managed by a holding company called MarketsTheWorld Ltd. The Isle of Man Gambling Supervision Commission regulates the operations of MarketsWorld. The reason for this is due to fact that binary options online trading is not recognized legally as financial investing but rather as a gaming activity. In this respect, MarketsWorld is different from other binary options online brokers in the industry as it is legally recognized as a gaming entity rather than a financial broker. The trading platform that MarketsWorld has provided its traders is a proprietary trading platform. The navigation interface of the trading platform is well designed with the assets located on the left side of the trading screen. The trading charts cover the majority of the trading screen. The chart can be displayed as a line chart or as a candlestick chart depending on the trader’s preference. Another nice feature of the chart is the fact that you can also change the time frame of the chart from a 5 minutes time frame to a maximum of 2 hours time frame. The only drawback of the MarketsWorld trading platform is the choice of option contracts that you can trade. At the present moment, the trading platform is only able to support High/Low binaries. The MarketsWorld trading platform is also available as a mobile trading app on the Apple App Store. Optimized for iOS powered devices, MarketsWorld’s traders can download the app to enable them to trade directly from their iPhones or iPads. Currently, MarketsWorld does not have a mobile trading app that supports Android powered devices. Nevertheless, android users can still access the MarketsWorld web based platform on their mobile devices as the trading platform is scalable. Currencies: AUD/JPY | AUD/NZD | AUD/USD | EUR/GBP | EUR/JPY | EUR/USD | GBP/JPY | GBP/USD | USD/CAD | USD/CHF | USD/JPY | USD/RUB | USD/TRY | USD/ZAR. There are only 2 types of trading accounts available at MarketsWorld, a demo account and a standard account. Although the choice of trading account types are rather limited, MarketsWorld has made up for this, with the minimum deposit requirement level. Rather than burdening their clients with a high minimum deposit requirement, you can open a live trading account with as little as $10. If you are a new client, you will also be able to claim a free $10 no deposit bonus from MarketsWorld by opening an account using the coupon code: NDB10. With $50 Risk Free trade bonus, you are given 2 chances to win your first trade by up to the amount of $50. To claim this bonus, enter the voucher code 50RFT in the deposit section before you make your initial deposit. As a new client of MarketsWorld, you will also receive a 100% deposit bonus. With this bonus offer, MarketsWorld will match 100% of your first deposit by up to $1000 in value. Currently with the exception of MarketsWorld, no other binary options online broker in the industry is offering this type of bonus to their traders. This bonus is given by MarketsWorld to their clients on top of the regular bonuses which they may be receiving from MarketsWorld. The bonus is calculated based on the trading volume as well as the duration of the trader’s custom. It is calculated automatically and credited to the trader’s account at the beginning of each month. The “Refer a Friend” bonus allows you to introduce a friend to sign up for a MarketsWorld trading account. With each successful referral, you will get the chance to earn $500 in bonus from MarketsWorld. As for withdrawal methods, they are the same as the method used by the trader initially to make his deposit. For example, if the trader initially deposited his trading funds using his Neteller account, then his withdrawal request will be processed back to his Neteller account. Withdrawal requests are typically processed within the same business day and require 2 to 7 working days to be completed. While there is no maximum amount which a trader can withdraw, there is a minimum withdrawal amount of $10. There is no withdrawal fee charged on the withdrawal made and traders at MarketsWorld can withdraw as many times as they require. The only requirement is that there can only be one withdrawal request pending at any one time. The customer support service at MarketsWorld is available on a 24/7 basis. Traders can contact the customer support representatives through email, fax, live chat or the telephone. In addition, the MarketsWorld website is translated into a dozen different languages such as Arabic, Dutch, French, Russian, German, Italian, Portuguese, Spanish, Hindi, Thai and Chinese. In terms of the response time, the support staff respond swiftly to any request for assistance with the live chat. There is no doubt that the quality of MarketsWorld’s customer service is one of the best in the binary options online industry. This is a major plus point about MarketsWorld as it imparts trust and confidence in the company. Although the trading platform provided by MarketsWorld is a feature-rich binary trading platform, they do not offer any other additional features outside of the trading platform. For example, there is no trading signal services provided by MarketsWatch, free or paid. Furthermore, there is also a lack of a dedicated knowledge or education base on binary options online trading. The educational resources which MarketsWorld have provided are essentially very basic. There are no tutorials or webinars available on the MarketsWorld website. Nevertheless, updated news feeds and market summaries are available through the website which will definitely keep MarketsWorld’s traders in touch of all the developments in the financial markets. Although MarketsWorld might be lacking in some areas, it should be noted that they do have ambitious plans for the near future. Traders can expect new developments from MarketsWorld as they start implementing their expansion plans. 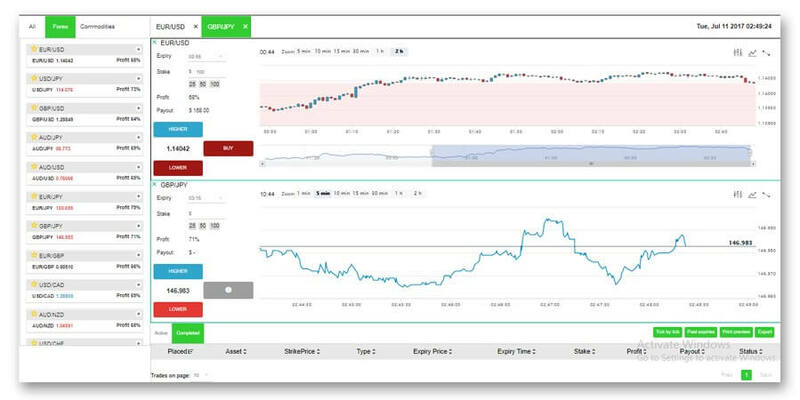 As of now, MarketsWorld has proven itself to be able to provide traders with a reliable and efficient trading platform. Their customer support services and bonus programmes are also something which is noteworthy as well. In conclusion, MarketsWorld has demonstrated that it is able to provide its clients with a safe, secured and efficient trading environment for both beginner and experienced traders. The high returns of above 90% and the generous bonuses offered by MarketsWorld are certainly enough to convince most potential binary traders to give this broker a try. Yes. MarketsWorld is a regulated binary options online trading platform under the Isle of Man’s Gaming Commission. How to open a free account at MarketsWorld? MarketsWorld does not charge traders to open a trading account. To open an account with MarketsWorld, simply fill out the registration form and submit it with all the required documentation for verification processes. Is there a Minimum Deposit requirement at MarketsWorld? Yes, there is a minimum deposit requirement at MarketsWorld. However to make it easy for anyone to open a trading account at MarketsWorld, the minimum deposit requirement is just $10. Can I open multiple trading accounts at MarketsWorld? No. MarketsWorld does not permit traders to open multiple trading accounts. This is in order to minimize fraud. Traders will be charged an administration fee of £30 per account which will then be closed. Furthermore, the winnings on a duplicate account will not be paid out. Is my money safe with MarketsWorld? MarketsWorld is one of the few binary options online trading websites that is authorized and regulated by a trusted regulatory agency. The Isle of Man as part of Great Britain has always been well known to be a leading international financial centre around the world. Since 2011, MarketsWorld has processed thousands of withdrawal requests for its clients. In addition, traders’ funds are kept in segregated accounts in Trier 1 banks. What ID does MarketsWorld in order for me to make a withdrawal? At MarketsWorld, there are no restrictions on deposit made into a MarketsWorld’s account. However to execute a withdrawal request, you need to show proof of identity and proof of address. Any government issued IDs will be sufficient to establish your identity. For proof of address, any recent utility bill or bank statement which shows your full name and address can be used.